An edited version of this article was first published as Book Review: Fahrenheit 451 by Ray Bradbury on Blogcritics.org. Given my left-wing dispositions, it's a surprise that I haven't read this book yet. But the chance has finally arrived, as a copy was given to me. There are things to be said about this book, and some are good and some are bad. But first, the requisite synopsis. The rather short novel centers around Guy Montag, a fireman. Mind you, it's not the fireman in the usual sense of the word. Rather, it is a fireman in a dystopian world that Bradbury paints in this novel, where books are banned, and there are people known as firemen who set fire to books that are found. Houses have been fireproofed (as a modern development), and yet when there is a suspicion that there's a book in a household, firemen will come over and douse the house with a flamethrower. Now why is this world dystopian? 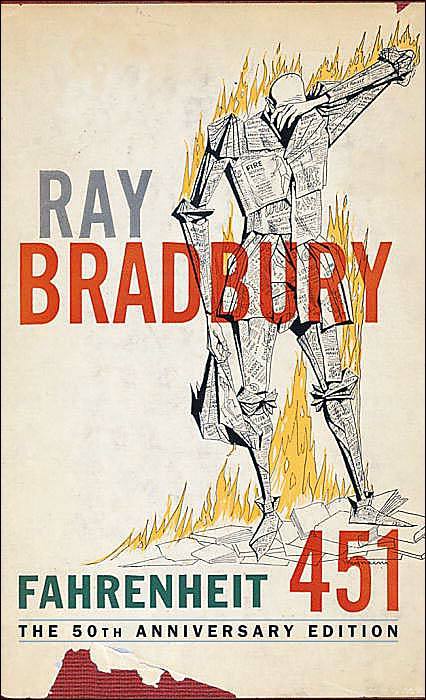 Well, Bradbury paints a world where people stopped thinking for themselves. Books are seen as receptacles of individualistic thought, and thinking for oneself is bad. If you think one way, it potentially offends some other person out there, and therefore you should refrain from doing so. Eventually, people just stopped thinking for themselves, and they ended up in a hedonistic society, where family takes the form of wall-to-wall televisions and the characters that are portrayed in it, and teenagers driving a car trying to kill a pedestrian just for the sake of doing so. As the novel progresses, Montag starts to think, and therefore ends up in trouble. He starts reading a book, and that has consequences. I won't reveal how the book progresses, as it is a rather short book that one can finish it in a few days. But let's just say that that is where the conflict of the book begins. You know, I should like this book. After all, it's a book that critiques group-think. It's a book that critiques mass establishments that control how society functions. There's mass misinformation, there's no trial system (people are automatically judged as guilty), and people evidently lost control of their mental faculties, that all they do is wait for information to flow from their wall-to-wall televisions (and this information is definitely biased by the government). Most importantly, people lost the ability to ask the fundamental question of why. That premise usually is something that excites me (I definitely enjoyed reading George Orwell's Nineteen Eighty-Four). However, somehow, there is a bad taste that was left lurking in my mouth as I finished this book. Well, for one thing, I thought that it was too small to develop such a complex topic as self-determination and the loss of critical thought. It was only less than 200 pages long, and therefore the story moved quite fast. You turn a page and there's already some other new action going on, while you're still digesting the events that were on the previous page. I wished there was more development: there were plenty of sentiments that the author could have expounded, and yet it was just glossed over, because it was indeed very fast. It read more as a short story, and yet it is a pity because the content is quite powerful in my opinion. I wish he wrote it as a full-blown novel, but given its size, it felt more like an airport novel, where it is intended to be a page-turner (and yes it indeed is), where the reader just zooms by, perhaps missing the import of the individual words of the book. Given that, I still think that people should read this book more. I am glad that I finally got the chance to read it, because to some degree, it reinforced to me the idea that I can think for myself, and I am grateful for that opportunity. Some people don't want to think for themselves, and would rather have someone else do it for them. Some people are content with just sitting down and waiting for a command, perhaps from some book that is apparently holy, and just follow it blindly, because they think that the book has divine inspiration and therefore is automatically true. I am glad that I have a brain, that I am a higher-level cognizant being, and I exercise use of my brain. This book paints a picture of what would possibly happen if people just stopped using their heads. It's not a pretty sight.